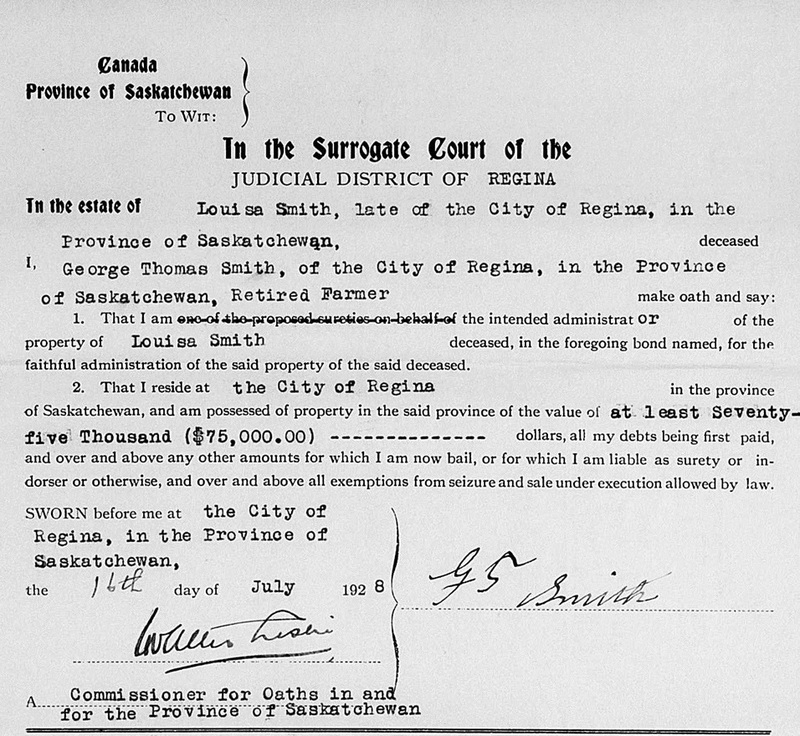 Sometime in the early to mid 1920s, Louisa Smith was diagnosed with breast cancer. As the disease took its toll, she was nursed at home by her daughter Audrey and was visited often by her other children. 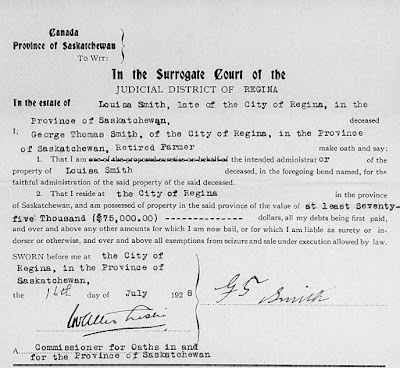 On the 8th of July 1928, she passed away at home in Regina, with much of her family by her side. Her funeral was held at the Knox Metropolitan Church, and she was buried in the Regina Cemetery. 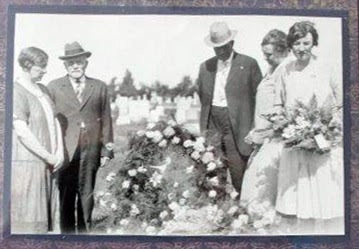 Bessie, George, George Jr, Maud and Audrey at Louisa's gravesite. Louisa left no will, so I was surprised to find a collection of probate documents relating to her (1). It appears that she had over $5000 in bank bonds in her name only, so George had to go to court to get access to these funds. As part of the process, he and George Jr had to agree to pay over $10,000 to the court if it was ever discovered that Louisa actually did leave a will and they weren't admitting it. I'm sure they never had to pay that debt. Nevertheless, they both had to swear to their ability to pay this amount, and state their worth. 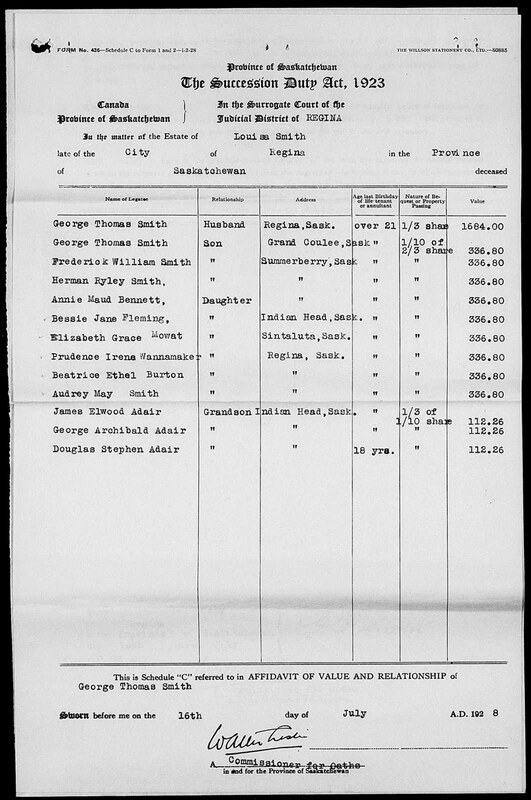 George declared that he owned assets valued at about $75,000. I don't know how much land he still owned at the time, but this tells me that he must still have owned some, probably at Summerberry. 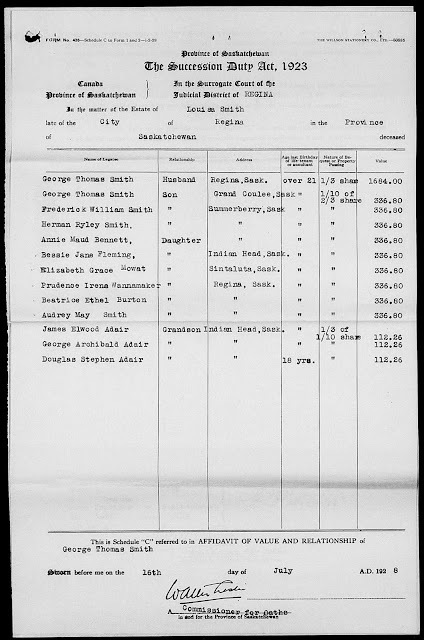 When George got the $5000, he divided it amongst himself, his nine children and three of his grandchildren, namely James, George and Douglas Adair. It may have been Louisa's wish that only these three, of the then twenty-one grandchildren, were to share in this money, perhaps because they had lost their mother, Clara, when they were boys. So Louisa's story has ended, and yet I haven't really said much about her. All I know of her personality comes from her daughters Prue and Audrey, who described her to my cousin Donna as someone who loved flowers and knitting, and always had a project in progress. She had a great fondness for Ireland and often spoke of her Irish heritage. She was a shy person who was happiest at home. Although shy and not fond of travelling, she must have been a plucky woman to leave her home in England and go with George into what must have seemed like the ends of the earth, with who knows what prospect of him ever making a decent living there. Perhaps she already knew what a resourceful person he was - and no doubt in their early days in Canada she had to draw on strengths she didn't know she had until then. Judging by the family she raised and the warm fondness they had for her and for each other, she must have been a very fine mother and homemaker, and a person it would have been good to know.